A humble vin de Pays which utterly belies its designation this is a glorious northern Rhône wine full of rich fruit and herb flavours. 100% Syrah. 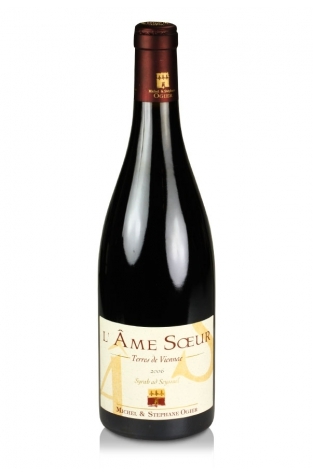 Michel & Stephane Ogier's Syrah l'Ame Soeur bears the simple appellation of Vin de Pays des Collines Rhodaniennes but delivers an exotic bouquet of flowers, jammy kirsch, cassis, licorice and underbrush with a medium to full-body. It is a gorgeously proportioned wine which belies its classification. Only 500 cases of this 100% Syrah cuvee were produced. A sleeper of the vintage, it tastes like a Cote Rotie with some Viognier in the blend. The Ogier family is a fabulous success story in the northern Rhone. They were a family of vignerons selling their entire production to negociants, but they gradually began to bottle their own wine, first the father, Michel, and more recently the ambitious and talented son, Stephane. The results are extraordinary wines that thrill drinkers. The Ogiers have taken a strong position in Syrah vineyards planted on the hillside terraces outside the old Roman city of Vienne, a few miles north of Cote Rotie. They have two totally different terroirs, La Rosine, which is Syrah planted on granite, and l’Ame Soeur, Syrah planted on schist. Both are very fine, value-priced offerings that offer a faithful introduction into the Ogier winemaking philosophy as well as to northern Rhone Syrah.